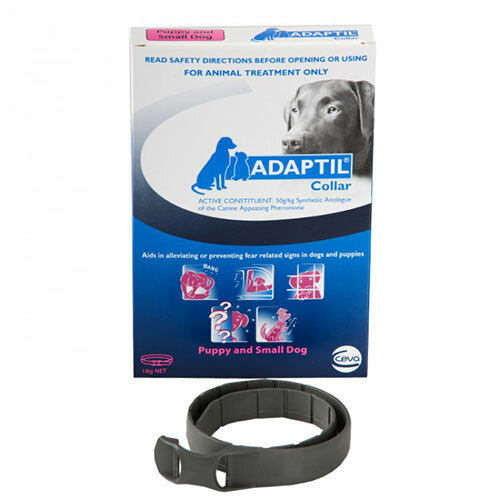 Adaptil collars for dogs work in a therapeutic manner in tranquilizing the pet during stressful situations. The collar contains synthetic form of Dog Appeasing Pheromones (DAP), which relaxes the pet’s body and mind. The calming effect of these pheromones gives relief from stress and anxiety. It improves the pet’s response during behavioural therapy and training. Lactating female dogs release appeasing pheromones to calm down the litter. Ceva has used this natural mechanism to create a collar that works as a tranquilizer. Adaptil collar contains synthetic form of these natural tranquilizers. Called as Dog Appeasing Pheromones (DAP), the ingredient works well in relaxing puppies and dogs from anxious moments and stressful situations like fireworks, loud noises, travelling, strangers, separation anxiety, change of place etc. 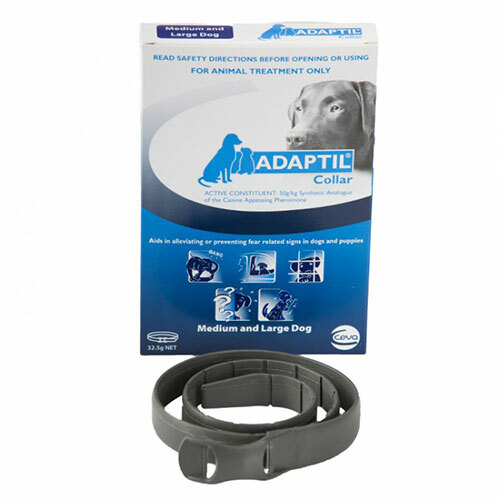 An Adaptil collar thus makes the pet relaxed and happy without the use of any external treatments. Buy as per your pet’s breed, build and neck length. Buckle it up around the pet’s neck in a manner that there is a space of two fingers between the neck and the collar. Trim the extra portion and dispose it off. Make sure that the collar is not too tight and the pet should not feel suffocated. Keep an eye on the pet to ensure that the collar fits well and is easy on the pet’s neck. Consult a vet for further details. Replace the collar on a monthly basis. This collar does well to reduce stress and anxiety in my pal and it also improves his response during behavioral therapy and training. This collar has helped me a lot when I was traveling this month.. a good material that doesn't strain. My dog was very calm also in new places and between new people. Normally he is very aggressive in such situations. We use this whenever we travel as our little dog is very anxious. A few sprays on her blanket before we travel and she relaxes a lot quicker the before and most of the time even falls asleep. I would really recommend this product. My three dogs are quite sensitive and get triggered even by little noise. And Adaptil collar has come in the right time as guys at Vetsupply suggested me this one. Happy to have it and even got it at free shipping. Works perfectly on my pug. No straining around the neck and no side effects. Got at great price. Thanks vetsupply.